The guts of a laptop packed into a tablet. This is the best hybrid you can buy. It is still not a laptop. Mind you that new kickstand also happens to be mounted to the back of the best Surface Pro yet. Microsoft dropped the number naming scheme with this fifth iteration, settling on simply “Surface Pro” and the name makes sense. This refined device, with its sturdy kickstand and quiet guts, is what the Surface Pro always should have been. It’s been tweaked to the 2-in-1's benchmark for perfection. The changes are all small compared to the Surface Pro 4. If you weren’t a gadget blogger or gadget obsessed you’d be hard pressed to see them at a glance, but they make a difference. The vents on the device are also more subtle than past iterations. They allow it to cool virtually fan free in the i7 version reviewed (the i5 and m3 models operate entirely sans fans). With a 7th-generation processor, it’s fast enough that I can edit a giant RAW photo file in one window, and watch a video in another and see zero slow down. The Surface also has fantastic battery life. I wrote the majority of this post in an airport bar, pausing during my four-hour layover to periodically read the news or play Civilizations VI, and I barely made a dent in the battery. I did run into one problem though—and it’s a fundamental one due to the nature of the Surface Pro and its fellow Windows 2-in-1s. Not all software plays nicely with its quick switch between laptop and tablet mode. Civilizations VI should, ostensibly, be perfect on a Pro. The big 12.3-inch display lets you see plenty of the continents you’re civilizing, and the Surface Pen ($60) can, when everything works perfectly, be a great tool for picking and choosing armies, towns, and everything else you do in the game. It seems like a game built for touch, like its siblings on the iPhone, but in practice that isn’t the case. Menus were non-responsive, and sometimes I couldn’t even get past the title page. I ran into the same problem in Gwent, a Hearthstone-like card game that should, again, be great on a touch display. The biggest compromise, though, is the kickstand and keyboard. 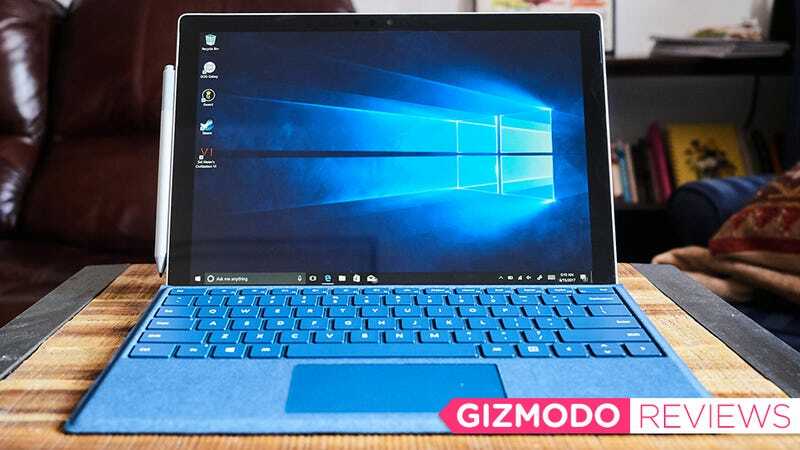 Yes, both are exceptional for a 2-in-1 device—the best I think you can get—but they mean the device will never feel as stable as a laptop, like the new Surface Laptop that ships later this summer. Though in this iteration it comes perilously close. 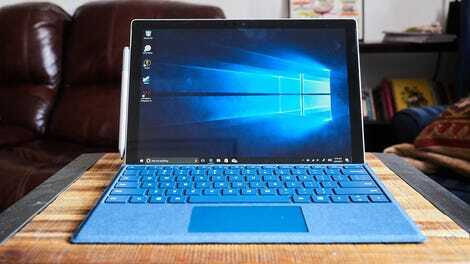 The keyboard is identical to the fabric-covered keyboard Microsoft released for the Surface Pro 4 last year. It’s a very good tablet keyboard. Better than my iPad one that’s started to fall apart, or the super stiff ones from companies like HP and Huawei that are more half-a-laptop. Still, no matter how good it is, it leaves the device very unbalanced when open, thus requiring a strong hinge to stabilize it. The Pen now comes separately, so plan to spend $60.